Went down to London to check out the sales today. Lots of good stuff at Christie’s — kind of sad to see the Rutland Poussin Ordination up for sale (I hope an accessible collection secures it for the public), but it was in fine company: a terrific El Greco St. Francis estimated at what seemed to me a steal (£600,000 – £800,000; I’d rather own it than the Poussin). A very fine, and acutely touching, 16th-century Pentecost from Bruges, with beautifully individualised apostles reacting to the divine irruption calling them. And lots more, plus a killer prints section with high quality editions of Goya’s Disasters of War and Proverbs, as well as a great selection of first-rate Dürers and Rembrandts. Anyway, the main reason I went down, was the exhibition over at Sotheby’s of the Kisters Sacra Conversazione by Titian, which goes on sale in New York later this month and will be on display in London through Wednesday. Painted 1560s, it is largely a studio production, probably laid out by the master’s faithful but pedantic assistant Girolamo Dente — the weak drawing of St. Luke at the left and the rote characterisation of St. Catherine’s head betray his hand, methinks. But it also shows plenty of the master’s work and seems to me really instructive in terms of understanding how he supervised such studio pictures. Inspecting it closely, it appeared to me that he retouched fairly extensively the figure of the Madonna, as well as the faces of the Child and Catherine, at an advanced stage of the production. The rendering of the flesh in these parts is richer, warmer and subtler, with hints of pink enlivening the cheek of the female saint and the mother of God taking on a glowing aspect, smoldering along the contours. There is, furthermore, a real difference in quality between the rendering of the saints’ garments and those of the Madonna. 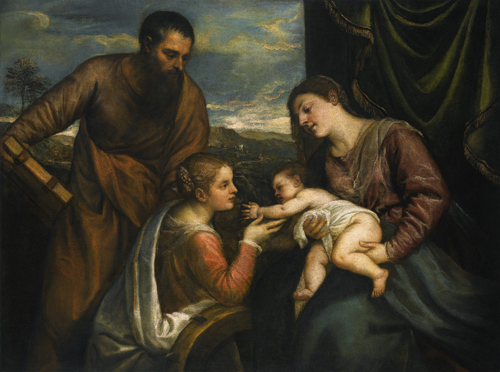 They are all painted according to the same principles — Titian’s — but in the former the effect is comparatively superficial, highlights and shadows never quite coalescing, while the latter in the reds has the depth of tone so characteristic of Titian’s hand, where colouring attains its own logic, beyond form. And the sky is glorious. Not just because of the thick strokes of yellowish white lining the dawn clouds, or the pink tinge lent to them in certain places, but also the deeper seep of purple glazing that gives it is depth, suggesting receding night and leaving a certain dampness in the air that suffuses the wet landscape below, suggested in mauve drybrushed in spiky, almost-turqoise. This is characteristic of Titian’s modus operandi in this kind of production, as I understand it: he leaves most of the figurework to his assistants, retouches the painting towards the end, adding the landscape in an inspired flurry. It is inspiring to follow. …I now have my one-liner for the dinner party I’ll be attending this weekend. Thanks! But really, El Greco is generally remarkably cheap when cosidered in the heavyweight class to which he so absolutely belongs. He fetches nowhere near the sums of, say, Rubens, Poussin or Rembrandt. So are you in, or are you in? Those are, ahem, perceptive insights, but this here’s too upstanding a blog for such filthy scheming. I will have none of it… (er, PM me).